The Town of Hamburg renamed several streets in the 1953-1954 time frame. The original street names can be found in the Sanborn Fire maps that are available at many libraries. 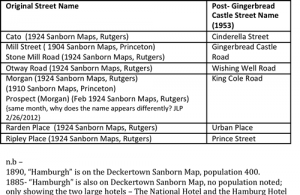 If you are interested in using the Sanborn Maps, they can be retrieved from Princeton and Rutgers Library websites. Helpful information about using the maps is available from Kent State Library.